Why is my blog called 'Train Guy Turns 40'? Well, as my earlier posts mention, I turned 40 in September. Thats the obvious part. I have been facinated with trains as far back as I can remember. I remember having a 'ride on' train when I was just a few years old. It was at my grandparents house. Apparently it was a quality train because my Aunts and Uncles could ride on it with me. I also remember my parents and grandparents would sometimes drive out of the way so that we could purposely be stopped at a railroad crossing so I could see the trains. I remember my Dad riding the train from Elgin into Chicago for work. I remember some of my earliest model train layouts. Most were only a circle of track, but I loved being in control of and building my own little world. I also remember receiving many model train related presents on my birthdays, and my great grandmother baking several cakes in the form of a train. I grew out of model railroading when I went to college. After college I didn't really have the time, space or money for model trains. I do remember visiting some of the local model train shows. My enthusiasm and interest in model trains was renewed when, after a couple of years of marriage, Katrina bought me a train set for one of my birthdays. I began to build a train layotu in our basement, only to tear it down for our move to Oregon. Once in Oregon I visited a few train shows and met Andy Epperly. He invited me to the local Corvallis Society of Model Engineers club. Soon after that I joined the Pacific Northwest Modular RR Club. I built my first module, which quickly became four, which soon became 12. 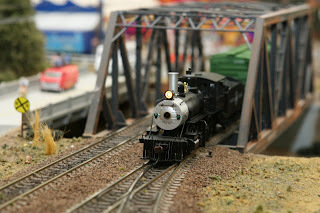 I was soon traveling to shows all over the northwest, displaying my model train layout and sharing my hobby with others. Going to shows has been the highlight of my model railroading. Sharing my layout with seasoned model railroaders and with newbies is the best. I look forward to our new adventures in Italy. Milan is full of subways, streetcars and commuter trains. Europe has many passenger trains that can take you anywhere in a matter of hours. I plan to visit and probably join a local model railroad club.